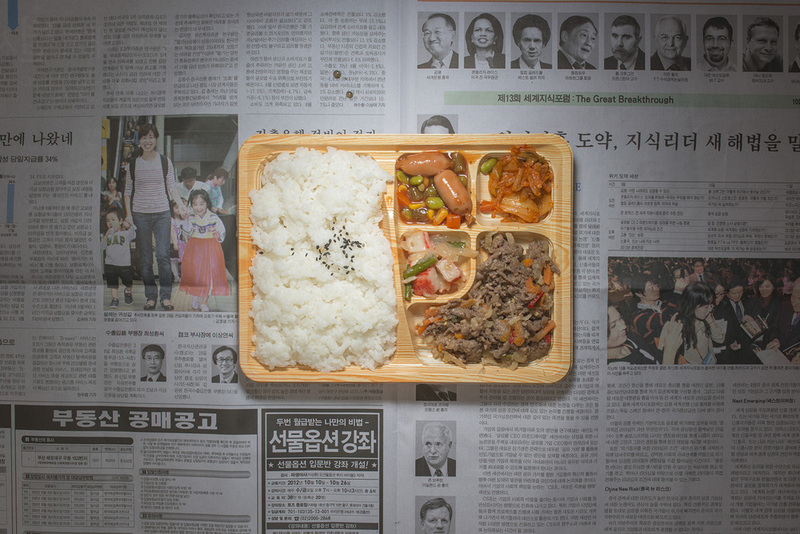 KRW 11,667; KRW 2,415 (USD 2.15, EUR 1.68) for food. This is based on per capita per-day basis of the absolute poverty line for Korea, and low-income household food expenditure. Korea had 3.2% of its population, or 1.5 million people, living under the national poverty line in 2010. The country’s Gini coefficient of households reached 0.311 in 2011. The elderly are seen as being vulnerable to falling into poverty, due to the public pension system and large number of self-employed. The poverty line is set by the Ministry of Health and Welfare, based on a minimum cost of living for citizens. As part of the OECD, Korea also monitors relative poverty line, which is at 50% of the population’s median income. Data on household income and expenditure measures are collected by Statistics Korea. Note: Latest available standards and exchange rates were taken as of October 2012, when the photography was undertaken.